Should Illegal Drugs Be Taxed? 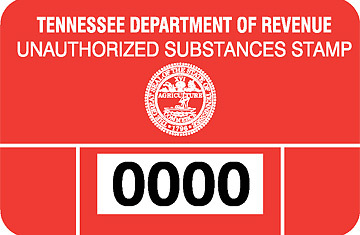 Tennessee's Unauthorized Substances Tax requires anyone in possession of a certain quantity of contraband to buy a tax stamp and affix it to the drug. In April of 2005, Jeremy Robbins was arrested attempting to traffic two tons of marijuana from Arizona to East Tennessee. Indicted on federal drug conspiracy charges, Robbins was soon assessed a $1.1 million fine from Tennessee's Department of Revenue. The reason: failure to comply with the state's Unauthorized Substances Tax, which requires anyone in possession of a certain quantity of contraband  in the case of marijuana, more than 42.5 grams  to buy a tax stamp from the state government and affix it on the drug. The so-called "crack tax" applies to controlled substances like marijuana and cocaine, and also illicit alcoholic beverages like moonshine. It allows someone to anonymously purchase stamps in person from the Department of Revenue based on the type and amount of the substance ($3.50 for a gram of marijuana, $50 for a gram of cocaine, etc.) with the understanding that doing so cannot be used against them in a criminal court. Posessing drugs is still illegal  the tax works completely outside the criminal justice system. A stamp cannot provide immunity from criminal prosecution, and a conviction of possession isn't required for the Department of Revenue to assess the penalties. Of the 726 stamps sold so far (some to collectors as novelty items), none have turned up during a seizure. The penalty for not having a stamp can exceed 10 times the original cost  and the Department of Revenue concedes that the tax was instituted with the expectation that most dealers won't buy the stamp. "Dealers can do it either way," says Assistant Commissioner for Operations Sam Chessor. "But in reality, the payoff for us is going to be on the back end, not the front end. " And what a payoff: since the tax was enacted in 2004 it has netted Tennessee $3.5 million in extra revenue, 75% of which goes directly to the enforcement agencies that carry out the drug busts. Still, some opponents argue that adding such steep penalties on top of criminal charges amounts to a second punishment, and thus a violation of double jeopardy law. "Aside from this incredible acrimony and bill-collecting mentality," says Knoxville attorney Gregory P. Isaacs, "you are divested of all your constitutional rights." For that reason, a Davidson County chancellor last summer ruled the tax unconstitutional, and stopped the state from collecting Robbins' $1.1 million. But the Department of Revenue, confident the ruling will be overturned on appeal, is continuing with the assessments. Says Deputy Commissioner Reagan Farr, "It's fine to have a criminal and a regulatory scheme running in tandem. We've made sure our statute is purely regulatory, not punitive." But no matter how you define it, the bottom line for Tennessee is that crime pays.